Leica tra realtà e finzione – Parliamo daltro – NewOldTime. 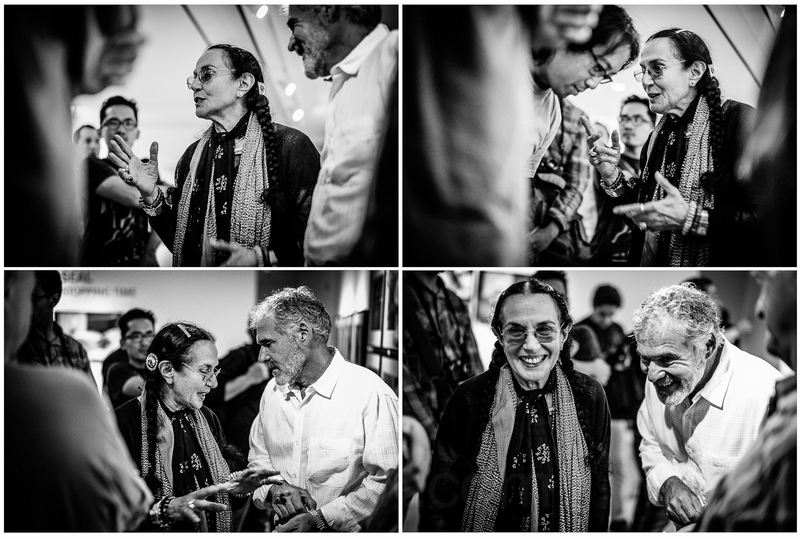 Reposting this from last summer when Mary Ellen Mark, icon of 20th century documentary photography, presented and discussed images from her incredible career upstairs at the gallery atop the (then) new Leica store in Los Angeles. The store was and is beautiful. The event was flawlessly executed. Mary Ellen Mark running a slide show (not really, it was a Mac-powered presentation) of her work and talking about it was a moving and humbling experience. But nothing, of course, matched the thrill of photographing her. During her talk she mentioned that the biggest mistake photographers make is, after they’ve taken a few dozen shots of a subject or situation, thinking they have the shot. She said she works a photographic opportunity to death and that was probably the best advice she could give to photographers. This is not advice I have ever needed to hear. After the presentation the great Mary Ellen Mark hung around to meet and chat with members of the audience and sign a few of her books. There were, of course, a number of people snapping pictures of her. I know these kinds of events, the light, the many challenges, etc. It’s why I’ve chosen the Leica M gear that I use with incredibly capable and expensive lenses like the 50mm Summilux 1.4. I was surprised to see that no other photographer at the Leica gallery was shooting an M – anything. Very surprised. There were X2 and X Varios but not an M that I could see. And consequently, no M glass. Well, at that point a light bulb went off in my head. A talking light bulb. It said, you’re the only photographer here with a camera and lens capable of pulling this off. It’s Mary Ellen Mark. Get to it! So I started moving around the room, moving in close and low when I could, struggling to hold the camera still on my end and hoping Mary Ellen et. al. didn’t move too much themselves so that I could come away with some sharp images. At first, Mary Ellen paid me no mind. Most everyone there wanted to meet her and set about doing just that. She was very busy and very gracious. I didn’t really want to meet her in a situation such as this. I don’t really count that as actually meeting someone. What would I say beyond expressing my respect and admiration which does very little but force her, in this context, to respond for the fiftieth time in ten minutes. But as I continued to move around stalking my shots I couldn’t help but notice that, after more than one quick glance my way, she actually became a more animated subject. You sometimes sense that people don’t want their picture taken. But Mary Ellen Mark, as a photographer who has inserted herself into so many desperate and even dangerous situations, shot so many difficult and dramatic human subjects, was familiar with and navigating that tension and resistance and the people projecting it to her long before I ever even picked up a camera with any serious intent. Mary Ellen did not, thank you very much, project anything like that resistance or tension to me. So I kept shooting. Adjusting my settings. Trying to think of everything. People were, of course, moving, jostling for position. It’s a crap shoot but you just keep going and going knowing that most of the shots you’re getting are throw aways. In retrospect, I wish I had done a lot of things different. I think I’d had too much caffeine. This goes on, well, sort of off and on, for about 20 minutes. I’m really the only person there behaving like a photographer, diligently snapping away at this scene. I don’t know how or why that was the case, but it was. Lucky me. At one point not long before I bailed, the fact that I wasn’t going to approach and meet her no doubt became apparent to her, as was it clearly mutually understood that I was photographing her and she was allowing me to photographer her. Either I had taken her advice to heart or came to the event already in possession of it. And it was at that point that Mary Ellen Mark gave me a look, a very sly smile, with squinted twinkling eyes. I have that picture but it’s not the most flattering shot. So these will have to do.